Mushreath is the meta-form of Shreema. It produces an extremely deadly toxin in its body that can have a narcotic effect when processed and refined. 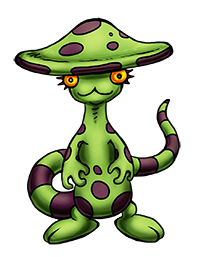 It abhors sunlight and dry heat - it lives in caves, burrows underground or hides in the shade during the day. It is clumsy and unsteady, so it will use its prehensile tail to anchor itself to the ground.